Updated: Aug 29 2012. I’ve tweeted extensively about my new iPhone, but haven’t written up a blog post yet. I love iPhone 4. The ultra high rez screen is a glorious sight to behold. I love the two glass sides even if that glass back may be a bit impractical. I bought Apple’s black bumper on day 1 and haven’t seen a scratch anywhere yet. Update: I’m now on the iPhone 4S and enjoying iOS5. I’ve updated the ends of several paragraphs below with more current information. See the italics sections for the updates. The iPhone 4 is a wonderful partner to my new iPad. Its iOS4 is a big upgrade. Multitasking was just what I needed to make using lots of apps a lot easier and quicker. So, iPad now has only a size advantage for viewing and typing. I’m waiting as patiently as I can for multitasking there which will be a huge improvement. But the iPhone 4 is back in full swing and I choose it often for my needs, even book reading when its size and weight feel more comfortable compared to the comparatively bulky and much heavier iPad. iPhone is wonderful when lounging in bed, when in line and whenever comfort is of utmost importance. The Camera. Still photos are my specialty. I’ve taken a couple of videos but that’s an area I’ve yet to explore in depth. I use the iPhone as the best camera I’ve got with me on most days and get quite good results. For productivity, though, the camera serves to take great scans of information I encounter including business cards, signs, book passages, magazines and newspapers. There are lots of apps that take advantage of the camera including a number of good portable scanning apps like jotnot. Update: The iPhone 4S camera is even better and more effective in all capacities. Jotnot is still really good. Evernote has just added some of these capabilities in its new Page Camera feature. Reeder. 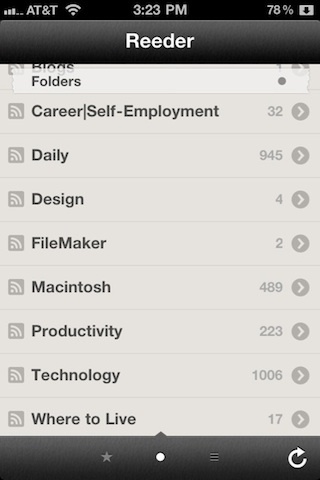 I love Reeder on iPhone as an RSS reader. Its key to success is the efficiency with which I can scan, read and dispatch articles. I feel like I have the best tool available to stay abreast of the news in my fields of interest. I can star articles, save them to Read it Later or Instapaper, or email the full article to Evernote to archive it when that option is permitted by the blogger. Reeder is excellent on the iPad as well. Update: Reeder is still number 1 but you should also check out Zite, Newsify and Flipboard which all work on both iPhone and iPad. Read it Later and Instapaper. I’m currently on a Read it Later jag and am using it as my primary, read later tool. It has the same kinds of pass it on features and the most frequent one I use there is to send the full article to Evernote. Unlike Reeder, I can use Read it Later’s website on my Mac to read articles. Read it Later is also on my iPad and is even better with a big screen. I haven’t done a feature by feature comparison between RIL and IP so I am not sure which will ultimately be my favorite. Update: ReaditLater is now Pocket and a strong competitor to Instapaper. I’m now more entrenched with Instapaper so recommend it above Pocket for its better fonts mainly. Twitter. I have been a big fan of Tweetie and really wish it would have stayed independent. But, I’ll still take the renamed and slightly modified Twitter as my favorite Twitter app for iPhone. I like to use Twitter as a complement to Reeder in learning about what is hot and happening in my fields of interest which include technology as you know. Twitter adds other sources from my 600+ person hive mind (the people I follow). If my favorite blogs aren’t covering something hot out there, my hive mind will let me know. Twitter lets me send articles on to Read it Later (or Instapaper) for reading later as well as emailing full articles to Evernote. Update: Tweetbot is the rightful successor to Tweetie and is my strong preference for iPhone, iPad and Mac (in Alpha right now). Evernote. I’m not as happy as I could be with Evernote for iPhone but it has saved me a few times when I needed to grab a piece of crucial information saved to Evernote. My main complaints about Evernote for iPhone are that (1) it’s often too slow to update or search and (2) it doesn’t let me edit notes — there are good reasons why but it is a fairly big limitation. Still, I’m grateful that I can get access to all the 5000 or so entries I have there from my iPhone anywhere and time. Update: Evernote has gotten much better and now allows editing of notes from iPhone and iPad! 3Banana notes. I was using Simplenote for a long time as my *quick note* capture tool, but I think 3Banana is better in a couple ways. I can add or take a photo and combine that with a quick note. This is huge. I can photograph something and write a note right there about what it is and what I want to remember about it. Both Simplenote and 3Banana are text only besides that. But 3Banana has another nice feature. You can use hashtags. If you enter #ToDo, for example, you can then click on any #ToDo to see all of your notes with that hashtag. Just add the # in front of a word and you have a hashtag on any word in the note. Also, 3Banana syncs to a cloud-based version that is available on any browser for editing, accessing or creating notes and of course as a backup of your notes and way to sync notes between devices such as iPhone and iPad! Update: 3Banana notes is now Catch notes and still a strong app for note-taking. iBooks and Kindle. Don’t leave home without your whole book collection. At least your ebook collection. I love having my reference ebooks available and often have the non-fiction and fiction items I’m reading on iPad here too. I prefer iBooks because of its multi-colored highlighting and great fonts which I like to indulge in. If I weren’t so enamored of those features, I would probably prefer the Kindle app because it then allows me to read an ebook on my Kindle, iPad and iPhone 4. At the moment, my infatuation with the iPhone 4 is keeping me from picking up my Kindle 2 so that’s not a big issue. Update: I’m back to buying eBooks at the KindleStore and then using Calibre with a plug-in to convert them to ePubs. I than drag them over to my iPad and iPhone. More to come soon. There are quite a few more tools in my iPhone kit.